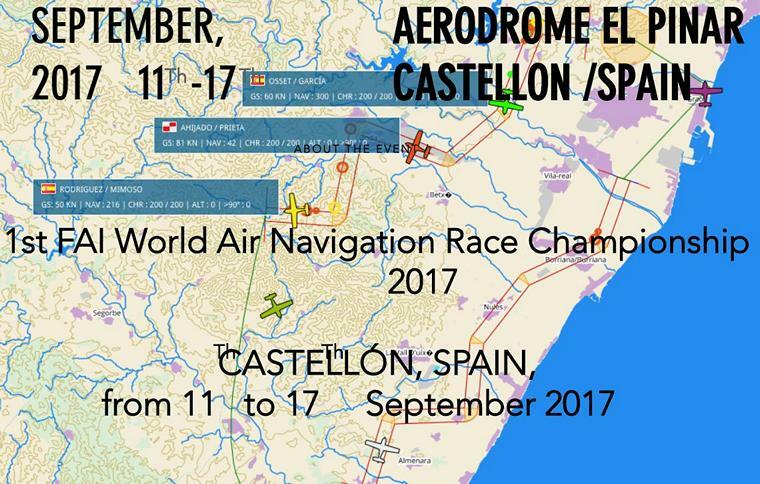 September 2017 launched the 1st Fai World Air Navigation Race Championships in Castellon, Spain. The event took place at a small coastal airfield called Castellon de la Plana Aeroclub which situated on the east coast of the Iberian Peninsula about 60km north of Valencia, south of Barcelona on the Mediterranean Sea . The airfield is superbly positioned in parallel to the popular beachfront and a mere stone's throw away from the Hotel Golf de Playa where the teams were accommodated. 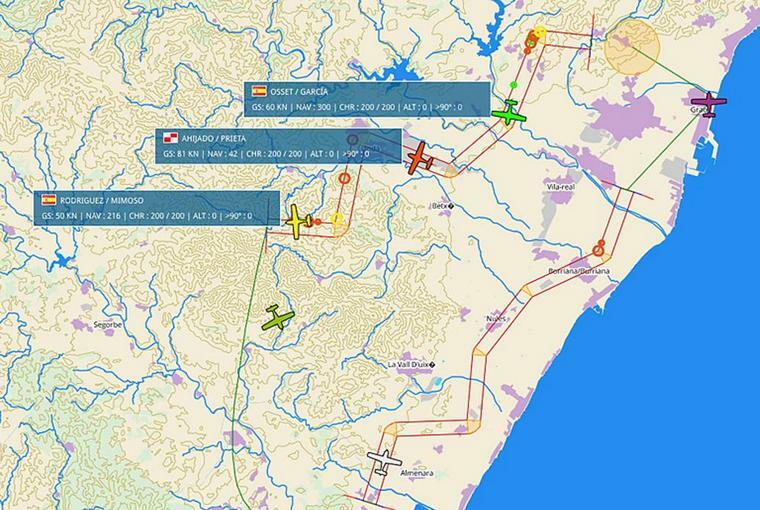 The initial idea was to introduce a sport that is fun for both pilots, navigators and spectators where all can watch the event live on a large screen using GPS transmissions with GNSS loggers, which are used to track the flight log. Flights are shorter that Rally and Precision thus reducing costs and opening the door for younger more inexperienced crews to participate. During the competition, the crews are given a map with a predetermined route of corridors of irregular shapes (known as Parcours). These are generated by sophisticated mapping software. The crews are allocated 45 minutes from start to roll to prepare their maps and get the aircraft to the take-off line. The start is generally positioned about 5 minutes flying away from the take-off point. Each aircraft takes off 3 minutes apart and has to cross the start at a predetermined time (to the second). Once through the start the aircraft has to fly along the narrow corridor with irregular shapes at a specific speed - all crews fly at 80 knots. The corridors vary in width from .3nm initially then reducing in width down to .2nm. This narrow corridor becomes extremely difficult to negotiate especially when required to perform acute angled turns. Penalties are awarded each time the aircraft flies outside of the corridor. The sport relies heavily on the acumen of a "2-man crew" …one to fly and navigate, and the second to navigate fully. These tasks are very challenging over mountainous territory or over miles of "nothing" such as corridors extending out over the sea. 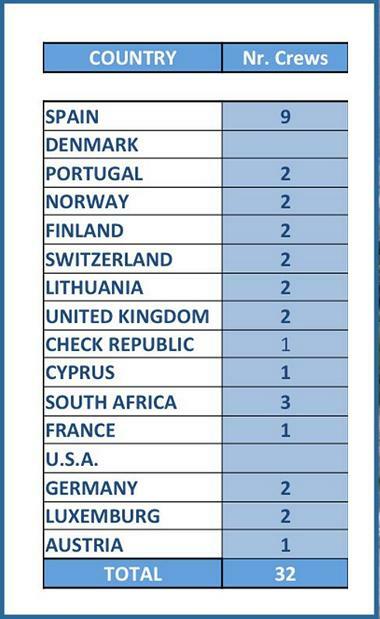 This year 14 Countries participated with 32 teams of Pilots and Navigators. The event was directed by Pedro Cabonero and Jesus Mas. The South African ANR Team was represented by 3 Teams of Pilots + Navigators, 1 Team Manager, 2 Judges and 1 Supporter. The crews arrived 3 days before the competition hoping to put in a good few hours of practice in order to familiarise themselves with the local terrain. Sadly the promised aircraft C152 from Portugal arrived 2 days late and this compromised the team's training schedule considerably. When it did finally arrive our SA crew had to spend a full further day fixing a starter problem, further delaying the practice schedule. In the meantime Mary and Thys were offered the opportunity to share the British C152 owned by the legendary Chris Barnes, which they accepted gladly. Being very new to this sport and without much previous training, the SA crews set about getting to know the territory. The actual town of Castellon is set on "map busy" flat ground but about a mile inland the ground rises into steep mountainous areas with little to navigate on. This of course made the narrow corridor flying very challenging. What increased the challenges even more was the fact that some routes were plotted out to "nothing" over the Mediterranean and with a 25kt Northerly blowing even the best navigational and timing skills in the world were no match for accurate flying. The South African Team have historically carved out a niche for themselves in terms of skilled landings and it is in this section where the crews show their true colours. In the team we were privileged enough to have Twice World Landing Champion, Ron Stirk (2 x Gold Medals and 1 x Silver Medal) as well as Gold Medallist Frank Eckard. After 96 total individual landings in near perfect conditions, Frank walked away with 1st Prize and proudly brought home another GOLD MEDAL for SOUTH AFRICA. Mary came in 7th position (having been ousted from 4th due to some international protests) and Hans finished in 14th position.